Portrait of Pediatric Nurse Cornelia Mercer at the Baltimore Union Protestant Infirmary, 1909. 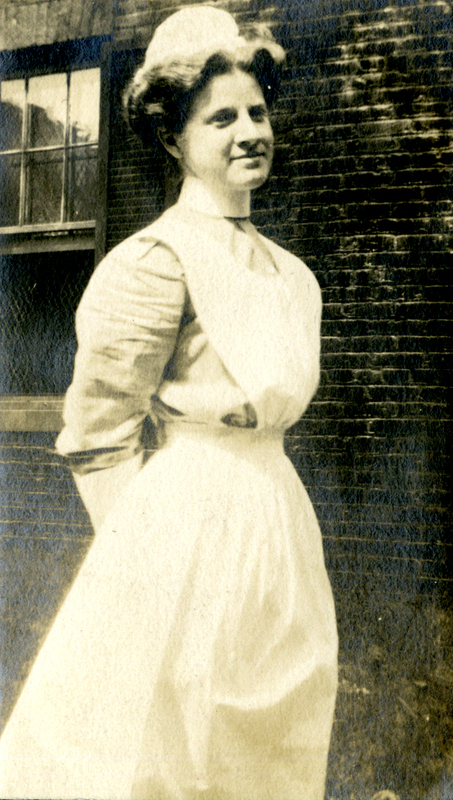 The image above features Cornelia Mercer, a pediatric nurse and nursing student at the Baltimore Union Protestant Infirmary, during her time there from 1909 to 1910. The National Library of Medicine (NLM) acquired an original photograph album that belonged to Mercer, containing personal photographs taken of her by fellow nurses, and photographs taken by Mercer herself of infants who were patients at the Infirmary. There is little known about Mercer except what is revealed in 87 small black and white photographs that comprise her photo album. Primarily we see an attentive pediatric nurse caring for infants and children confined to hospital beds and wheelchairs. It is undocumented what the infants and children were suffering from in these photographs, but common conditions found among this demographic at the turn of the century included tuberculosis, pneumonia, and influenza. We also get a glimpse into Mercer’s personal life through a few photographs she included of a ski trip she took with friends in Montreal in 1905. The institution where Mercer worked, The Union Protestant Infirmary (UPI), was founded in Baltimore in 1854 by seven women as a place where, “the sick, the poor and the infirm” could receive quality care. With room for only 20 patients, UPI became the first non-university hospital to develop a residency training program and by 1890 the School of Nursing (now closed) was established. Today the Infirmary operates as MedStar Union Memorial Hospital, an acute care teaching hospital with a strong emphasis on cardiac care, orthopedics, and sports medicine. The early 1900s was a period of rapid growth for nursing starting with the establishment of the American Journal of Nursing in 1900 and the founding of the Army Nurse Corps in 1901. Licensure for nurses was also a new practice, with North Carolina passing the first nurse licensure act in the United States in 1903. These advancements, and the impact on communities from communicable diseases caused by the rapid population growth of European immigrants, increased the need for trained nurses. By 1900, the number of training schools increased to 432 (up from 35 in 1883). There were, however, few schools that specialized in pediatrics. Although the specialties of pediatric nursing and medicine were growing, few hospital’s had children’s wards, and the admission of children was restrictive, with some hospitals not admitting infants and others only admitting children with certain medical conditions for fear of spreading contagious diseases. This photo album provides a glimpse into the everyday life of Cornelia Mercer, who dedicated her work to helping the children of her community, and who’s treasured memories now help us understand the experiences of women working in the burgeoning field of pediatric nursing at the turn of the century. Here is a selection of images from the photo album. Pediatric Nurse Cornelia Mercer with fellow nurses at the Union Protestant Infirmary in Baltimore, Maryland, ca. 1909. Circular framed photograph of Cornelia Mercer posing with a fellow nurse, ca. 1909. Cornelia Mercer adjusts the position of an infant patient lying in a crib, ca. 1909. Cornelia Mercer poses with four fellow nurses at the Union Protestant Infirmary in Baltimore, Maryland, ca. 1909. In a rare recreational photograph, Cornelia Mercer is seen skiing with friends, possibly Gus and Mary Gallagher, in Montreal, 1905. In this jovial photograph, Cornelia Mercer and two nurse colleagues smile and have fun posing for the camera, ca. 1909. Cornelia Mercer holds an infant patient and poses with three nurse colleagues at the Union Protestant Infirmary in Baltimore, Maryland. Behind Mercer is an unidentified man whose arm is around another infant patient, whose hand is being held by one of the nurses, ca. 1909. Some of NLM’s nursing-related exhibitions include, Pictures of Nursing: The Zwerdling Postcard Collection and Confronting Violence: Improving Women’s Lives. Learn about other exhibitions on the History of Medicine Division’s Exhibition Program website. Visit the National Library of Medicine to view this and other photographic collections in the History of Medicine Reading Room. For questions about this album, please contact the History of Medicine Division Reference staff at NLM Customer Support.